Thank you to each and every one of you who have “liked” my Facebook page! 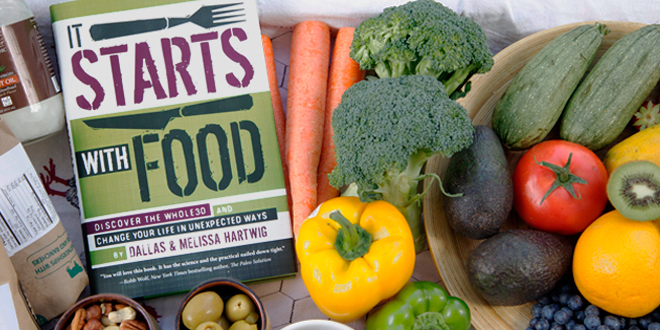 As a token of my thanks, I am giving away a copy of “It Starts With Food” and a pound of One Drop Coffee’s coffee! Just click on the Rafflecopter image below to enter (there are two easy ways to enter)! Giveaway closes Wednesday, October 17th. Thanks for the great blog, look forward to your inspiring posts! Congrats on making 3000!!! I would love to see a recipe on how to spruce up chicken with some general spices not too fancy but flavorful. Is there any way to make a Paleo friendly phyllo dough? Well, wouldn’t that be divine??? I’m not aware of one, but I’ll look into it! I enjoy your recipes and ideas for whole30 or similar eating styles. I am still struggling with lunches for my kids- especially the picky 4 year old who wants to eat pb&j sandwiches every day. I’d love to see more about how to get young kids on the paleo train! I love your blog! great resource! Thanks for all your wonderful posts! I love your cross fit challenges. Keep’em coming! I’m kind of new to your site so I don’t know all that you may have already posted. With Thanksgiving around the corner, I’d love to have some recipes to take to family gatherings. Sometimes changing those old family recipes or expected holiday dishes is difficult. However, I am open to making new healthy traditions! Thanks! I am new to your fan page and facebook. Absolutely love it! I would love a blog (you may already have one on it) but I need help and advice on how to get your kids to not complain about eating clean. No grains and such. I’m trying to start it in my house but it’s been hard with my oldest always complaining about it. Thanks! I’d love to hear more about how you’re dealing with (unwilling) family members when it comes to paleo foods. I look forward to all of your posts! Found this blog a couple of weeks ago when I was looking for at home crossfit workouts! I need to get back in the wagon with CrossFit and Paleo and you make it possible! Thanks for the inspiration! Love, love, love all the stuff you do! I’d like to see some stuff geared towards kid lunches and snacks. Some out of the box creative stuff! More winter squash recipes! Love ’em! Thanks for hosting the awesome giveaway! I loved the curried pork chops you have on the site. I love your blog and all the great recipes you post…thank you for all you do! Congrats! Love your blog and am glad to have found it. Your weekly menus and CrossFit challenges have kick started our home schooling year in the best way. Thank you! Recipes using eggplant! My boys grew some in their gardens and besides Ratatoulli I don’t know what to make with it. Thanks for putting awesome stuff out there! I’ve made some of your recipes and they’re always great! Thank you for all the great recipes! I love your blog and have been passing along your link to all my Paleo friends! I love your blog and all of your great recipes! I always know when I make your recipes that they will turn out great. Thank you!! Congratulations on hitting the 3,000 mark! With the look of snow outdoors today, fresh cranberries comes to mind. Or if that doesn’t work, snack ideas for my construction-minded husband would work also. Your up-beat attitude comes across in your blog making it an easy and enjoyable read. I love your recipes and my family does too. Thanks for sharing with us on your blog! I have a friend I would love to give a copy of this book to. It’s my all-time favorite foodie book! I really enjoy following you! Thanks for all you do! Would love more egg and nut free breakfast recipes. Thanks for all you do, love your blog! I love reading your blog and your recipes. I also have a large paleo family (5 boys, 2 of whom eat more than my husband and I, and they’re only 9 and 11!). I would love to read more about how you feed your kids and how you budget (both time for cooking for everybody and financially). thank you for the great recipes and good motivation!!! First let me say that I love you blog! It is very inspiring that you have so much going on in your life and find the time to feed your family so well. I have two little ones myself, so I’m always looking for fast, kid friendly, REAL food recipes! Keep up the wonderful work!! Great blog!! My family is dealing with food sensitivities and allergies, so I’m on a mission to feed my family real food!! Thank you for providing a valuable resource!! I would love more squash recipe’s. Your are such an inspiration! Thank you for all that you do! I would love to see a receipe for a creamy mushroom soup. I’d love more chestnut flour recipes. I’m having trouble finding recipes that use it. I would love recipes that don’t involve almond flour, or any other tree nut. Some of us are allergic. Plus, that stuff is expensive! BTW, you should call yourself WonderWoman. All the work you do with the kids, the food, the blog…. it’s so impressive! Loving you clean eats (esp non-nut recipes) and crossfit at home! I would love to see more varieties of simple recipes that combine nuts into “power bars”! These are such easy snacks. Love the variety of recipes as they are…keep them coming!!! I would like to see some pumpkin heavy recipes that aren’t nut flour based. I have yet to have success using coconut flour and pumpkin. I love reading through your posts! I have gotten some great ideas from what you make (although I frequently modify the recipes to fit our specific needs). I’d love some more ideas for lunches that my husband could take to work. Stumbled on your site and immediately realized I had been hearing alot about Paleo diet from friends recently. Gonna take note of lots of this now! The coconut/banana bites will be breakfast tomorrow….dang I had banana bread today! Awesome blog, and awesome giveaway! THanks to you! I would love to see a Paleo eclaire recipe! Yummy!